Anyone know how to sew? About mid-morning my daughter’s preschool teacher called me. “Sorry to bother you at work, but Bailey fell off a stool and bumped her head. She is OK, but I think it will need a stitch or two.” She had fallen off a stool and hit her head on the door stop on the door frame. Ouch. Thankfully, the teacher’s demeanor set me at ease, so I wasn’t too worried but you never want to hear about your kid bleeding. When I got there, Bailey was in the school office with the administrator, her teacher, and the nurse. The administrator was holding her as Bailey was holding some gauze to her head and a few drops of blood were on her shirt. I tried to act nonchalant as I moved the gauze to see the wound. I think I pulled it off pretty well. Honeybun met us and we went to the urgent care clinic. We only had to wait a few minutes to get into the exam room. The nurse cleaned the wound. It was only about 1/4 inch long, but it went deep and was laid open pretty wide for such a short cut. The doctor was a woman from Nigeria. She had a great bedside manner. Honeybun was worried about scarring of course. The doctor explained her young son had a similar cut and they used Dermabond (essentially a glue) to put it together. They like to use that because it is quick to do. The problem with it is that it tends to make a bigger scar. Then the doctor said, “But she’s a girl, so I won’t use that. We’ll do it the right way.” Stitches it was. It takes longer to do and so is a little more painful, but done right, the scar shouldn’t be noticeable in the long run. The worst part was the Lidocaine. The doctor asked me to hold her head, but even though she was crying, she didn’t jerk her head. The kid is tough. Near the end of the stitching, she cried again complaining that it hurt, but she didn’t move her head. Even the doctor was impressed. 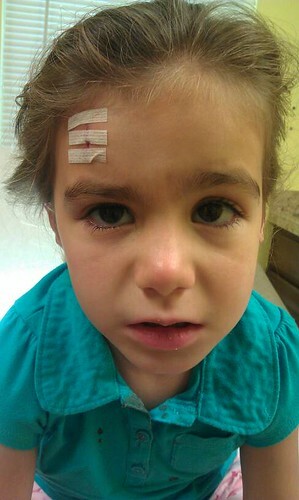 So, we got stitches. A right of passage of sorts. Even better timing. School pictures are in two days.